The L.A. City Department of Building and Safety really does cite illegal billboards, and they’re sometimes even removed. Here’s an example, very minor in the overall scheme of billboard scofflawism, but worth noting nevertheless. Vista Media erected the billboard shown, plus another, on a gas station property on Centinela Ave. in West L.A. early this year. After receiving a complaint, inspectors issued an order to remove them on March 27. The company failed to comply with the order in the requisite time, and the complaint was referred to the City Attorney’s office for further enforcement. That office filed a criminal complaint, which was scheduled for trial on Feb. 11 of this year, but the company obtained demolition permits for the signs on Dec. 19, and they vanished shortly after. It’s worth nothing that Vista Media was the first company to sue the city to block it’s 2002 inspection and inventory program, and the first company to settle that lawsuit, in 2005. 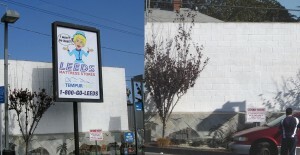 In that settlement, the company agreed to remove 500 billboards erected without permits, but according to a recent building department report, not a single one of those signs had been removed. The company was recently acquired by Lamar Outdoor Advertising, one of the largest billboard companies in the U.S. But here are two questions: How much revenue did the company collect during the year or so after it erected the billboards in full knowledge that they were illegal, and why should it be allowed to keep those ill-gotten gains? To Complain About An Illegal Billboard, Call 311.